Will write in the next day or two about the spectacular new Gardens by the Bay, which opened a few months ago near Marina Bay in Singapore. In the Flower Dome, one of two terraria in the gardens, British chef Jason Atherton has opened the Singapore branch of his Michelin-starred London restaurant, Pollen Street Social. Simply named Pollen, this posh restaurant is meant to bring a touch of Provence to the Lion City. 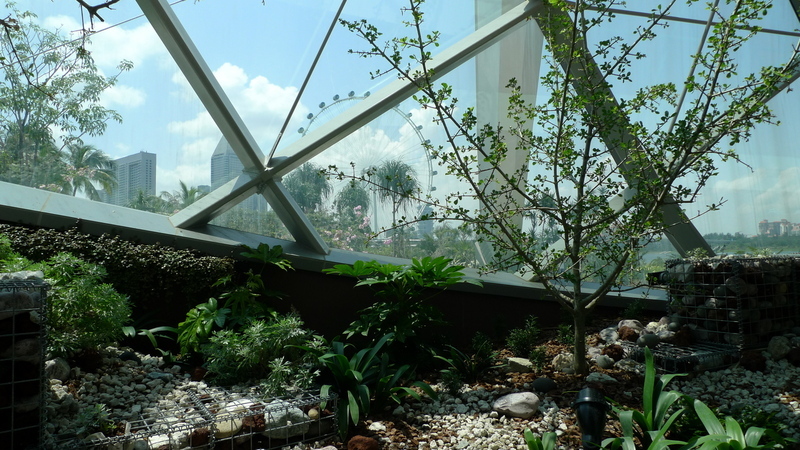 The main dining room is located on the ground floor, below the actual Flower Dome exhibit area. A tea room is on the exhibit floor. 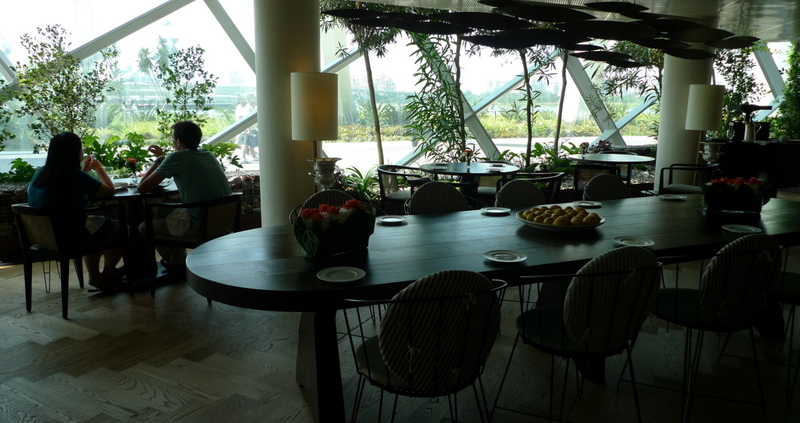 If you arrive with reservations, an electric tram will meet you at the entrance to the Gardens by the Bay and drive you to the restaurant’s entrance, which is on the back side of the dome. After your meal, you are invited to walk up a ramp directly from the restaurant into the dome – no need to pay the entrance fee. The view from our table, looking out at the Singapore Flyer. Chef Atherton has worked under Gordon Ramsay in several restaurants and now has his London restaurant as well as a restaurant in Shanghai and Singapore. Pollen makes his second Singapore location. The restaurant’s menu reflects the Mediterranean climate inside the Flower Dome and there is a lot of innovation and finesse without it being fussy. 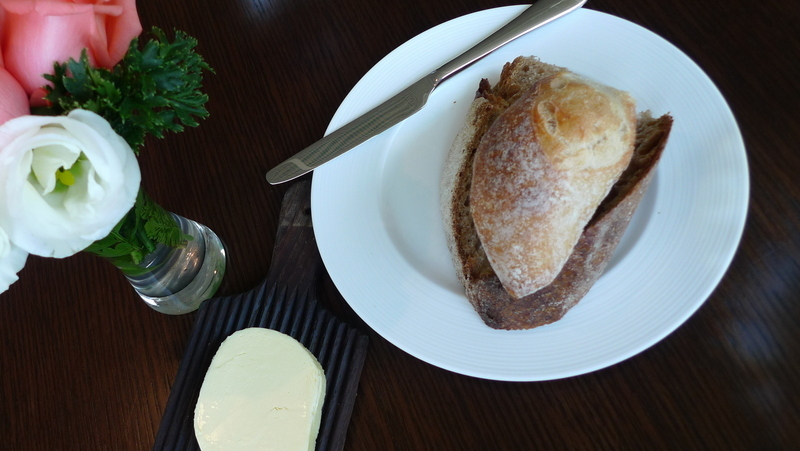 Even before receiving a menu, the wait staff brings a large basket of fresh bread, all of which is wonderfully tempting. It is nice to be made to feel welcome but the wait for the menus did seem overly long. 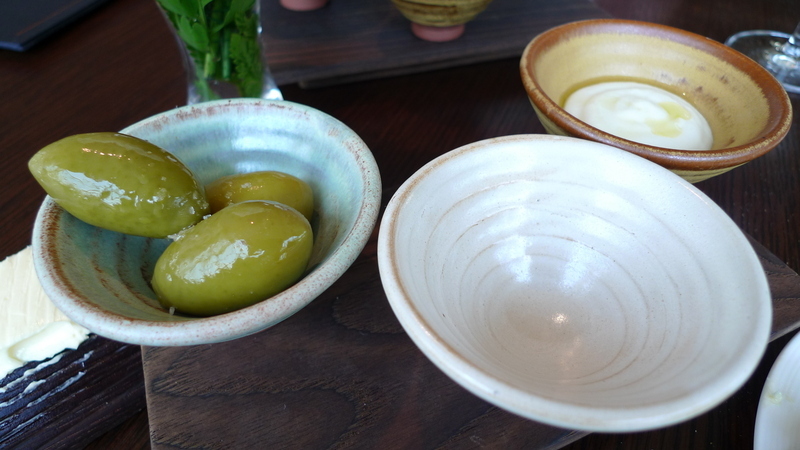 Two servings of olives and a white bean hummus were provided to our table of four, an amuse bouche of sorts. 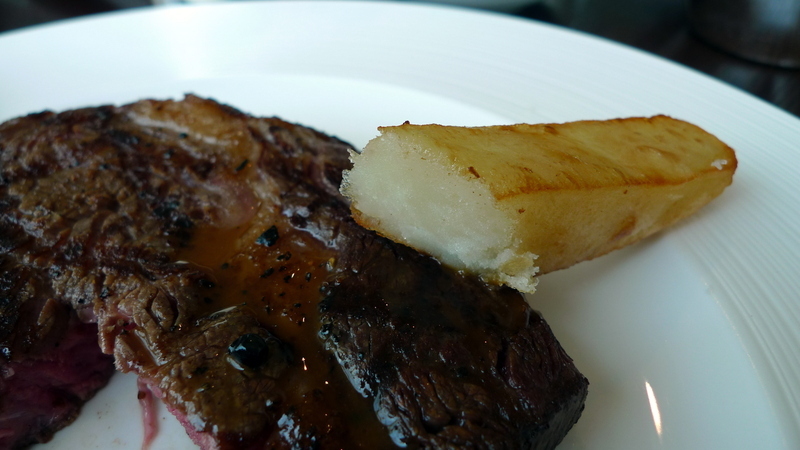 The menu features a fixed price three-course lunch set with three choices for each course, for S$ 55 – about US$ 45. Two of us went for the set while the other two ordered a la carte. 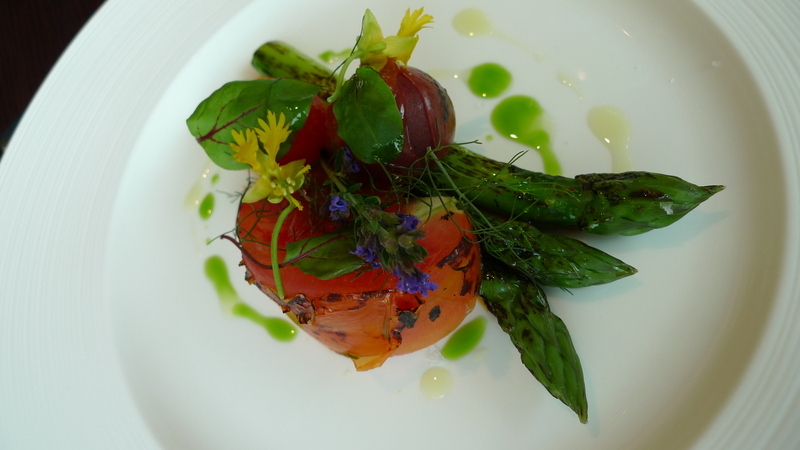 One of the starters from the lunch set, an asparagus and grilled heirloom tomato salad. It was topped with edible flowers and microgreens and the basil oil was very intense. The ingredients were of excellent quality and the presentation was beautiful. 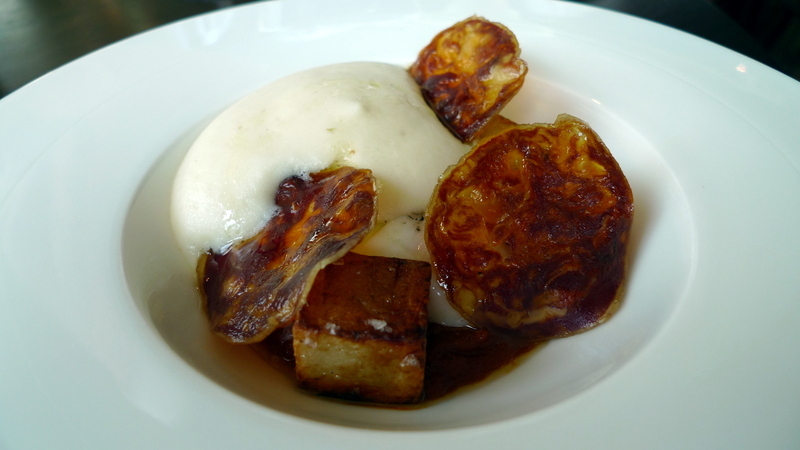 This dish, the picture of which doesn’t reveal everything, is a slow cooked egg served with chorizo and patatas bravas. Patatas bravas is a classic Spanish tapas dish of diced fried potatoes served with a spicy tomato sauce. There is a white sauce on top of the dish that hides the egg which was perfectly poached – firm but tender white with a silky liquid yolk. This was a good example of a simple dish with robust, complex flavors. The third option for the starters was home smoked salmon with beer pickled onions and spiced eggplant. 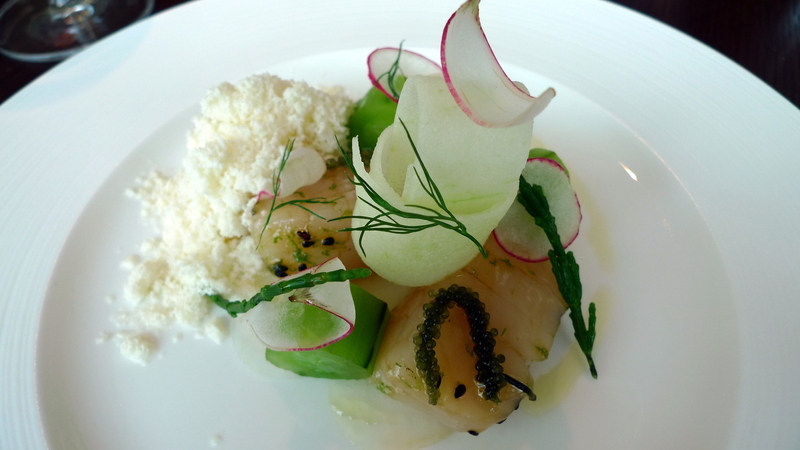 My fellow diner, Chor Phan, ordered a starter from the a la carte menu, scallop carpaccio, cucumber, apple, and horseradish “snow.” The scallops were nicely prepared although I had something different in mind when seeing the word “carpaccio” on the menu. The use of sea grapes (a type of sea weed) was interesting and the horseradish snow was playful and added a lot to the flavor of the dish. It was also a very sculptural plating. 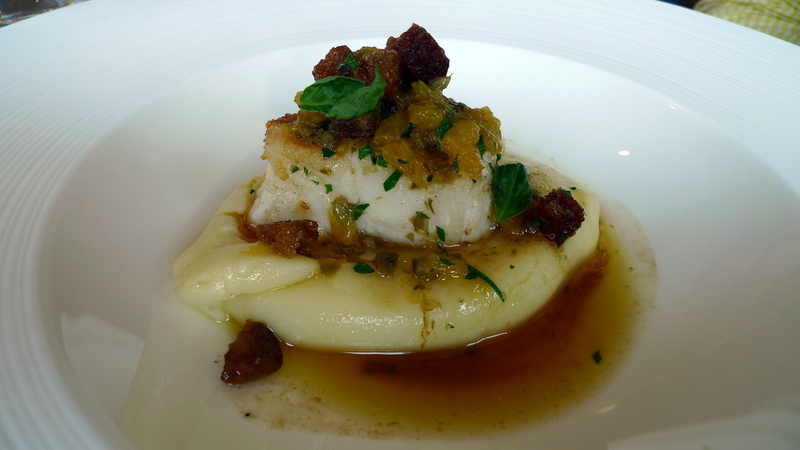 For the main course, Tawn had the roasted Brittany cod, creamed olive oil potatoes, and grenobloise sauce, which is a brown butter sauce made with capers, lemon, and parsley. The fish was really well done and the mashed potatoes were decadent. 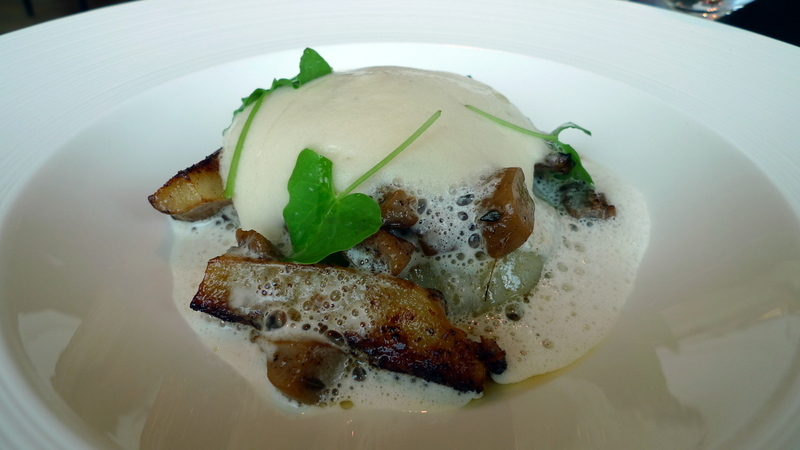 David ordered the roasted artichokes with sauteed wild mushrooms and potato foam. Despite my weariness of foams, this dish was really nicely executed and very flavorful. The third selection from the mains (which we did not order) was a specialty of the Singapore branch of Pollen: marinated lamp cutlet with asparagus and prickly ash. For our main course, both CP and I ordered the Rangers Valley 300-day rib-eye steak served with duck fat chips and green salad. 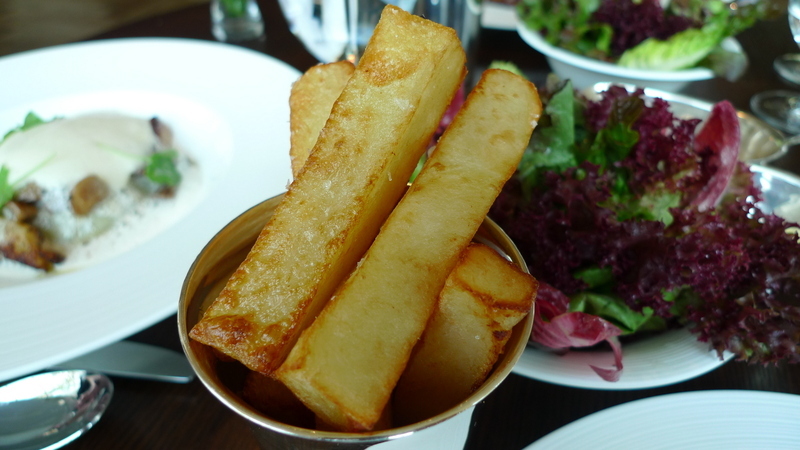 The duck fat chips are just what you might expect: thick cut “French fries” fried in duck fat. The salad was beautiful – the large bowl of greens artfully arranged and misted – literally, it looked like dew – with a very flavorful dressing. Inside look at the chip, which was creamy and soft inside but not quite as crispy as I would like on the outside. The duck fat adds a lot of flavor but also left the chips with a heavy feeling. As for the steak, the “300 days” on the menu refers to the amount of dry aging the steak went through. Most steaks, if dry aged at all, are done for only a few days. The dry aging process concentrates the natural flavors of the beef. This was a good steak, cooked correctly and with a nice peppercorn sauce. That said, I ended up sprinkling some salt on it because it seemed underseasoned. Service was good overall, but with some inconsistencies. The wait staff is a combination of locals and foreigners and the foreigners seemed to be more sophisticated in the service. As an example, I found a hair in my salad – something that is an especially big faux pas at this caliber (and expense) of restaurant. A Singaporean server apologized and took my salad to the kitchen. A few minutes later, another server (a European woman) brought out the replacement salad and another order of fries and set them on the table. The Singaporean server, standing nearby, realized a mistake had been and she started to tell the European server that the fries belonged to the table next to us. The European woman quickly stopped her and said, “No, this is a complimentary order; the other order will be out in a moment,” although the look on her face suggested that she had in fact made a mistake by giving me the fries. My point is that the European server in this case realized that taking the fries off my table would look very uncouth, especially given what had happened with the salad. Bringing another order of fries to the adjacent table was better than picking up a dish that had just been placed on my table. The Singaporean server seemed more concerned about the error in the order. Our lunch reservation was at 2:00, so by the time we were ready for dessert, the restaurant was almost cleared out. The manager invited us to take our dessert at the bar, since the sun had reached our table and was making the dining a bit uncomfortable. The benefit of being at the bar is that we were able to watch Pollen’s pastry chef, Andrew Lara, and his assistant create their magic. Lara is an alumnus of elBulli, chef Ferran Adrià’s three Michelin star winning Spanish restaurant that closed last year. Lara’s work is exquisite both in flavor and composition. 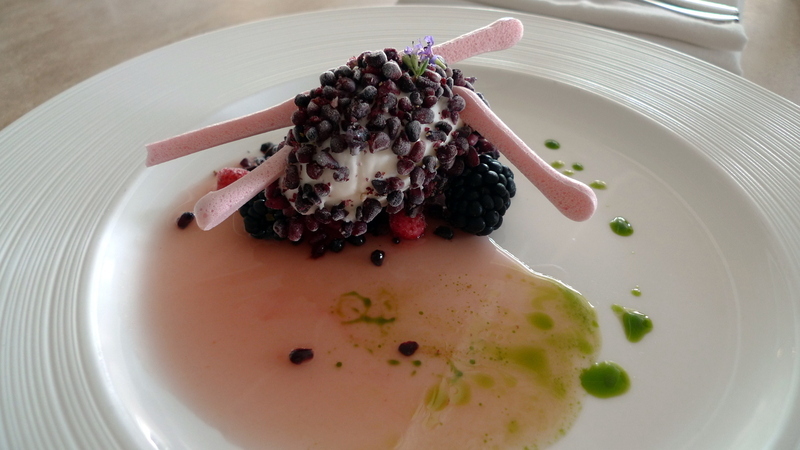 Here is frozen blackberry, goat cheese sorbet, rhubarb consommé with mint oil. The pink sticks are meringue. The process of watching him create these desserts was the same as watching a painter or a sculptor. The combination of textures and flavors was perfect, satisfying in a way that a simple, cloyingly sweet and rich dessert could never be. The mint oil was vibrant, the rhubarb consommé piquant, the goat cheese sorbet tart and creamy, and the berries cool and meaty. Crispy and burnt lemon with cucumber sorbet. The “lemon” is a crispy lemon meringue (the white thing with the shavings of lemon zest) and the dollops of soft meringue bruléed with a butane torch as the plate is constructed. The cucumber sorbet is peeking out from underneath but was cool and full-flavored, just like eating a perfectly ripe cucumber but creamy and smooth. Another example of a dish that was both simple and complex. We also had the chocolate, roast cocoa nib, ice cream, jasmine parfait, and cherry. Sorry for the focus being on the back half of the plate and not the dessert itself. 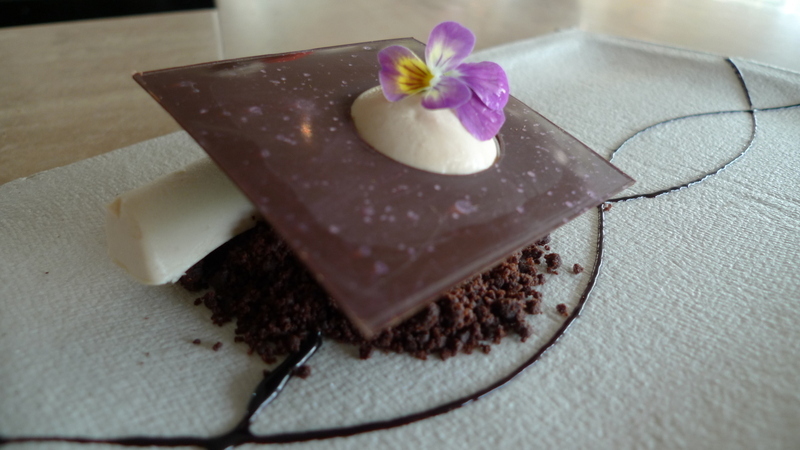 This was also a complex dish, all the more so because the cocao nibs were bitter and crunchy, which contrasted with the jasmine parfait and the sweet chocolate. Unlike so many molten chocolate cakes I have had or other one-note desserts, this satisfied my sweet tooth without setting me into a diabetic coma and paralyzing my taste buds with chocolate monotony. After dessert was done, Chef Lara gave us some truffles and these homemade “Magnun bars” – small chocolate-covered ice cream bars that were a perfect end to the meal. All in all, Pollen was an enjoyable dining experience, but one that didn’t quite live up to my expectations (Michelin starred chef) or the price, which was steep. That said, the experience was very pleasant and we enjoyed it with a pair of good friends who were just the right people to share such a meal with. 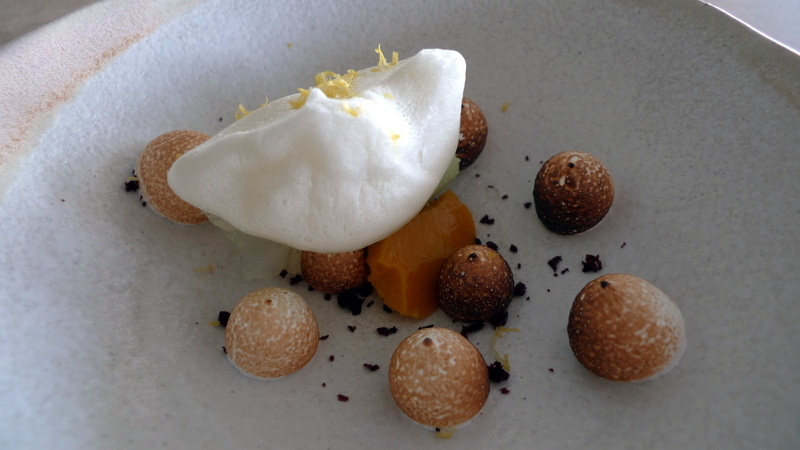 This entry was posted in Uncategorized and tagged Andrew, Atherton, dessert, Dining, elBulli, food, Jason, Lara, Michelin, Pollen, Restaurant, singapore by christao408. Bookmark the permalink. Now that is an amazing place to dine and relax. The food is so artistic it invites taking small bites to enjoy the meal to it”s fullest.Love these reviews you do of the many wonderful spots to dine. That was some quick thinking on the waiter’s part. I didn’t realize they could order extra fries when they made a mistake. BTW, if you are weary of foams and stuff, have you heard of flavored air? I’ve had a couple of experiences with restaurant staff in Colombia who were more concerned with defending themselves than with keeping clientele. In one case, a friend had a hair in his soup. Rather than simply apologize and offer a different dish, the kitchen staff tried to convince him that it was corn silk (which it clearly wasn’t). At a gorgeous place on the fortress walls of Cartagena, I ordered Dubonnet. The waitress brought me a shot of Dubonnet and a glass of ice. When I combined them, I discovered that the ice had melted and my Dubonnet was watered down to a horrible Koolaid. I asked the waitress for a replacement, and instead our table got a visit from the bartender and a burly security guy. I was told it was my own fault for not draining the water out of the glass! This looks like a delightful restaurant in the making ~ ~ ~ A wonderful review, Chris, showing off the good, and explaining the disappointments. That is a lot of dishes but that is part of the presentation. I suppose olives is a lot less filling than some of the bread that some restaurants provide. I guess some side plates of preserve pickles might be considered other than olives.It is good that Singapore has so many quality restaurants. I wonder what other city supports restaurants like Singapore? Manila, Singapore, and Bombay (Mumbai)? A very nice and detailed review, Chris!Seems like the dessert courses are more sophisticated than the luncheon dishes. Besides, a human hair (thankfully not a cockroach) in the salad is a total failure in my books. They should not include the charge of that dish in your final tab! While the food looked excellent, the hair in the salad and the taking away of food from the table would leave a bad taste in my mouth. Maybe the wait staff needs more training. Certainly someone need a hairnet in the kitchen. Very thorough, as always. Being able to know everything you are eating and to evaluate it is an art in itself.The hair would pretty well ruin the experience for me. I would be wondering with each mouthful how more hairs slipped by me.Do you discern those individual ingredients? What a taste you have. I don’t think that a fine restaurant in the US would make it with a name like Pollen. Maybe that word has a different meaning in Singapore. Great review. Too bad about the hair. Though, it was very nice of the european waiter to bring the fries as a complimentary dish. @Grannys_Place – Thanks for your kind words and the recommendation. @ZSA_MD – Yes, it was thoughtful of her. Sadly, I don’t think it was intentional and she may have placed them on our table mistakenly… plus, I was too full to really eat any more fries! =(@Ricardo98 – I think the word has the same meaning… it is a derivitive of the full name of the chef’s London restaurant, Pollen Street Social. Would be curious to see how it would work in the US. @Wangium – Haven’t had flavored air but have seen the concept. I guess at the French Laundry or somewhere, they have these pillows filled with cedar chip smoke or whatnot and small punctures. The main dish is placed atop the pillow, slowly releasing the sceneted air as you eat the food. Something like that, right? @ungrandvoyage – Yeah, you don’t keep your stars with things like that. @Roadkill_Spatula – Corn silk!? I hope, at least, that the hair was blonde. Ha ha…@slmret – Thanks for your kind words as always. @agmhkg – I hope you enjoy your trip there. It really is getting super expensive, more so than HKG. @Inciteful – Thanks for your kind words. I have to compliment the chef: these dishes are pretty simple, without a lot of ingredients, so you really do get the individual flavors. That egg, chorizo, and patatas bravas dish was a perfect example of this. @Fatcat723 – The hair in the salad was definitely a miss. You expect more from any restaurant but especially one with a reputation and price as high as this one. @CurryPuffy – You are right – I think the desserts were more sophisticated than the savory dishes. @PPhilip – Here in Southeast Asia, there are few cities that pull of really good high-end Western cooking. I’m not even sure that Singapore has that many places of a really global calibre. Hong Kong has some, Bangkok is starting to see some, too, but not much. It’s actually easier than that, Air is in a baloon. You inhale it in mouth. the dishes seem so complicated. 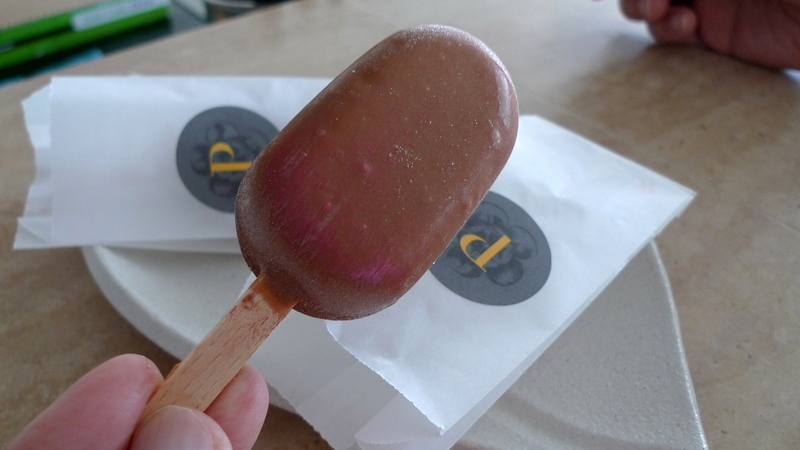 it is then a surprise to see that a ‘magnum bar’ is presented at the end of meal. something so simple looking.